At the “Mitsopoulos Farm” we follow a fully integrated line of production. We have a system of full traceability from the breeding of the animals all the way to standardization, which connects the final product to the chain of production. Thus, we can have full control at any stage and guarantee the quality and safety of our products. The first and very important stage in the Farm’s chain of production is the privately owned breeding plant. There, in Kalentzi, Corinthia, we collaborate with recognised Universities and one of the world’s top pig breeding companies to breed high-yield pigs that guarantee the production of high quality meats. Our animals stay in Kalentzi and are bred there, in our farm. They are raised in a certified, friendly and spotlessly clean environment, and every day we pay special attention to all factors that will ensure their well-being. Each animal is closely monitored and meticulously examined by specialised staff. Because above all, what we care about is its correct development and its good physical condition. Our animals are fed freshly-ground feed that is produced in our privately-owned mill. From selected cereals and under strict monitoring. By carefully selecting the composition of the diets with experienced scientists, and given the high nutritional value of the raw materials, we ensure the correct raising of the animals to the maximum. The feeds on our farm are based on cereals of the Greek earth such as corn and barley. THE POINT CONNECTING THE PRODUCTION OF THE ANIMALS WITH THE PRODUCTION OF MEAT IS AT A SEPARATE LOCATION, AT OUR SLAUGHTERHOUSE IN KALENTZI. 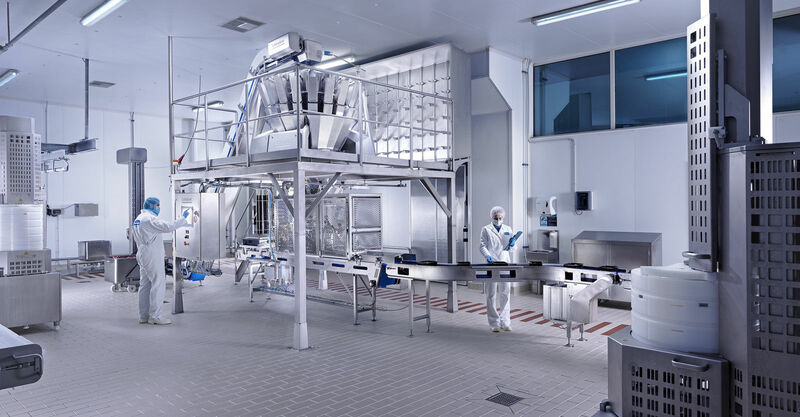 The process followed is totally conformant to all the conditions of the ISO22000:2005 Food Safety Management System and it ensures hygiene and safety of the produced carcasses. Also, our specialized associates monitor the whole process on a daily basis and confirm that at all stages, from the receipt of the live animals to the qualitative classification of the carcasses, the quality remains stable. Since 2003, the processing and standardization of meats on our Farm takes place in our specially modified plant in Kritika of Ancient Corinth. This 15,000 sq. m. area was created in accordance with the most stringent criteria of Community legislation, and its technology allows it to cover all consumer and business needs for fresh packaged meat, meat products and sausages. Our equipment and the innovations we apply to boning, cutting and packaging, ensure the safety and quality of our meat and have made us one of the most flexible, modern and competitive companies in the field. This is confirmed by our many strategic collaborations. In an ongoing effort to develop and aim at providing even better services while protecting the environment, we installed a biogas plant in Kalentzi, Corinthia, fuelled by the sewage of the pig farming plant and the residues of other agro-industrial plants. - the reduction of the volume of waste, converting it into a valuable soil improver. - the reduction of gas emissions and consequently the greenhouse effect. - the production of biogas, a renewable source of energy which can be converted into electricity with suitable equipment. The “category 3” animal by-products inactivation plant is in Kalentzi, Corinthia, in an area of 7,500 sq.m. It manages the rejected parts of the carcasses from the slaughterhouse and the standardization plant, in accordance with national and community legislation, in conditions of high temperature and pressure and specific time, thus protecting public health. Its aim is the production of final bone meal and fat products, supplied for the production of pet food and biogas. With the use of licensed vehicles and refrigerated storage and unpacking chambers, we manage animal by-products of companies with similar activities or food retailers, also giving a solution to the problem of disposing third party “by-products”.